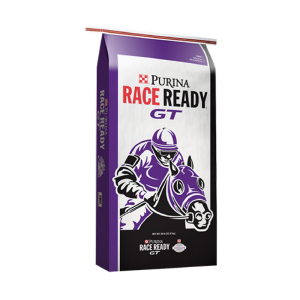 Purina Race Ready GT horse feed is formulated to meet the nutritional demands of racehorses and helps support proper immune function and a healthy gastric environment. The demands of racing can place equine athletes under varying degrees of stress. That’s why our Ph.D. Equine Nutritionists and Veterinarians developed a performance horse feed that meets the energy demands of elite athletes with special additives to provide optimal support when your horses need it most – during times of stress. Purina Amplify Horse Supplement included, which contains multiple sources of fatty acids from flaxseed, stabilized rice bran, and vegetable oils to help maintain body condition, healthy hair, coat, and skin. Purina Race Ready GT horse feed contains Purina Outlast Gastric Support Supplement, which is designed to support proper pH in horses that experience stress. Research has shown up to 90 percent of racehorses will experience gastric discomfort. Don’t let it derail your training and performance plans. Developed by our team of Ph.D. Equine Nutritionists, Purina Race Ready GT horse feed supports proper immune function and a healthy gastric environment for optimal performance. Ocala Breeder’s Feed and Supply carries Race Ready GT and a full line of Purina horse feeds and supplements.